And the company has a new AR car-shopping experience, too. Capital One is no stranger to trying new things -- especially when it comes to technology. Its Eno texting chatbot, for example, is a quick and conversational way for its customers to check their balances and perform simple tasks, like checking on recent transactions. Now, the bank is bringing Eno to web browsers with an intriguing new feature: virtual credit-card numbers. 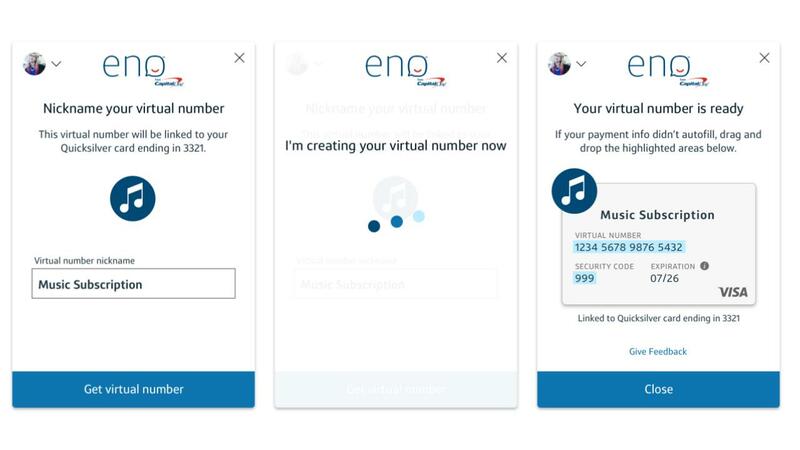 Whenever customers check out from an online store, they'll be able to quickly generate a new card number from the Eno plugin, and use that number for repeat visits. Whenever they return to the store, Eno will also auto-populate the virtual card and their billing info. It's tied to customers' actual credit accounts and it functions just like a real card number. The idea is that you can create individual virtual cards for every retailer, so if something like the Target hack happens again, you'll be able to quickly halt charges or delete the card completely. All the while, your actual credit card is safe. The Eno plugin will only work with credit cards, but Capital One says it's working on bringing the feature to debit cards. It might seem like a stopgap measure for wider banking-system issues, but it's a faster way to protect consumers than waiting for the payment industry to wise up, representatives told Engadget. At the very least, it's an easy way to get some peace of mind while shopping online. Additionally, the company is launching an augmented-reality feature for its Auto Navigator app, which helps shoppers find cars and quickly secure financing. Instead of searching for financing information about a car manually, you can just hold your iPhone up to see make and model details right above the vehicle, as well as what your monthly payment would be. It's still in its early stages, but it could help shoppers to navigate car lots without being pestered by annoying sales reps. This AR feature is iPhone only, but Capital One plans to bring it to Android. For now, users on other platforms can upload photos of cars to Auto Navigator on the bank's website. It'll fetch the same information, it just won't be floating above the car in real time. With both products, Capital One is trying to push the idea of banking forward by providing genuinely useful tools for consumers. We've never seen competitors offer virtual cards in the same way, for example. The company isn't divulging too many details about how its technology works, but representatives noted that it was similar to the way mobile payment offerings like Apple Pay handle tokenization. Whenever those services handle a transaction, they create a random virtual number, rather than passing along your actual account information. The AR feature, meanwhile, relies on a machine-learning algorithm that can identify thousands of car models. Ultimately, it just serves as a simple way to grab a car loan through Capital One.